John Eugene Loeper, age 73, of Mechanicsburg, and formerly of York, passed away at Conestoga View Nursing & Rehabilitation while being comforted by his loving family on Wednesday, March 27, 2019, after a long battle with cancer. John was born on Friday, July 20, 1945 in York to the late Albert Loeper, Sr. and Margaret A. (Cochran) Loeper. In addition to his parents, John is preceded in death by his son, Scott Loeper, who passed away in 1986. John’s survivors include his wife of 39 years, Barbara “Barb” Jane (Kosco) Loeper; his three children: Michele Loeper of Lancaster, Daniel “Dan” Loeper of Harrisburg, Julia Loeper and her husband, Jonas Fortune, of South Carolina; his granddaughter: Abby Herbert of Lancaster; his three siblings: Rose Wise, Margaret Arnold, and Albert Loeper, Jr.; his beloved feline companion, Cookie; and several nieces and nephews. John graduated from York Catholic High School as part of the class of 1963 after which he attended radio broadcasting school in Washington D.C. which began his radio broadcasting career. John was a radio personality in both York and suburban D.C. and a station manager at WANB in Waynesburg. He was a football and basketball play by play announcer at Waynesburg University. In fact, he even met his loving wife, Barb, at radio station WSBA in York where he was an on-air personality and she was a broadcast journalist. Their love for each other and broadcasting came full circle when their daughter, Julia, followed in her parent’s footsteps and became an executive producer at WYFF4 in South Carolina. John was a life-long and devout Catholic and member of St. Joseph Catholic Church in Mechanicsburg where he served as a lector and prior to that he was a member of St. Ann Roman Catholic Church in Waynesburg where he served as a lector and a member of parish council. He was a former member of the Knights of Columbus and the Elks in Waynesburg and a member and past president of the Waynesburg Area Chamber of Commerce. John was active with the United Way in Greene County having served for several years as their Annual Campaign Chairperson. He had an intense interest in politics and was a proud and loyal member of the Democratic Party whose principles he stood by; traits which found their way into his daughter Michele’s heart. John loved sports and was a passionate fan of the Pittsburgh Steelers and Penguins, passions that he shared with his son, Dan. John’s happiest moments were spent with his family and his family smiles as they remember their family trips to the beach or watching sports or debating politics or just watching TV and laughing together. John will be deeply missed and forever loved. All are welcome to join John’s family at his greeting of family and friends gathering on Monday, April 1, 2019, from 4:00 p.m. to 6:00 p.m. at Buhrig Funeral Home and Crematory, 37 East Main Street, Mechanicsburg, PA 17055. John’s family invites everyone to join them at 6:30 p.m. for a Dutch treat wake where you can hoist a glass and drink a toast to John at Marzoni's Brick Oven & Brewing, 4931 Ritter Road, Mechanicsburg, PA 17055. All are also invited to join John’s family at his Mass of Christian Burial on Tuesday, April 2, 2019, beginning at 1:00 p.m. at St. Joseph Catholic Church, 410 East Simpson Street, Mechanicsburg, PA 17055; with The Reverend Thomas J. Rozman celebrating. Burial will follow at 2:45 p.m. in Holy Savior Cemetery, 3420 North Susquehanna Trail, York, PA 17406; with Deacon Jack Paruso officiating. Contributions in celebration of John’s life can be made to the Multiple Myeloma Research Foundation, 383 Main Avenue, 5th Floor, Norwalk, CT 06851, https://TheMMRF.org/donate. 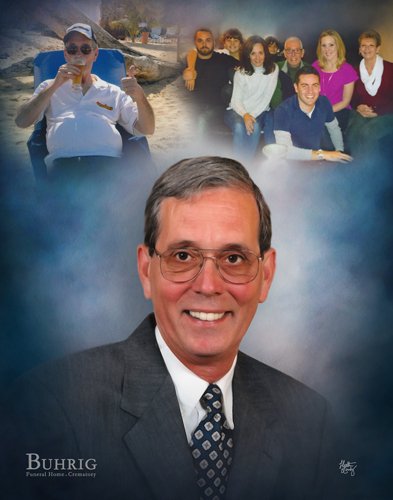 John’s family has entrusted his care to Myers – Buhrig Funeral Home and Crematory in Mechanicsburg, (717) 766-3421. Read John’s full obituary, view his memorial video and portrait, and sign his official guest book at Buhrig.com.